I have been pondering about things that would never enter my mind at 'home' (meaning Canada - I think). This is something that is running around in my head, still without an outcome or conclusion. I want to try and express it here and would welcome input from anyone. I am living in a country where social status has a bearing on things. I could say that while living in Canada I never really thought about my social status. It never crossed my mind to think that I grew up in a poor family or a wealthy one. When I socialised with people I never thought about whether I was in their 'class' or not. That said, I was never under the illusion that my parents were rich either. My first thoughts about wealth, or lack there of, occurred while living in Nicaragua. This was probably due to the fact that this was the first time I lived among the poor. I saw people who didn't have the basic things that rich or poor in Canada have; I was never without. Things like three meals a day, a roof over my head and clothes. Although, by Canadian standards, we lived below the poverty line (or at it) - so we were 'poor'. Yet, by Nicaraguan standards, I was wealthy. I lived this dichotomy. It was hard to be 'rich' whether I perceived myself as such or not. To have when others didn't wore on me. In Canada we have a large middle class - who are neither rich nor poor. I never thought about it. We had enough. I do recall my children saying that they wished we were 'rich', like so and so, meaning that then they could have what they desired. But I never really thought about it. Now we are living in Mexico for the second time. A class structure exists here, just as it did in northern Mexico. One notices it in dress (somewhat), in restaurants, in vehicles, and especially in where they live and the jobs they hold. We are living amongst what is said to be the middle to upper middle class. We are trying to assimilate and fit into this class. I often feel like a '3 dressed up as a 9'. I once again live with this internal tension. But now it is much different. I am perceived as a wealthy person, because I am white, a Canadian. I drive a nice car and live in a nice neighbourhood. However, by Canadian standards, I am still near the poverty line. 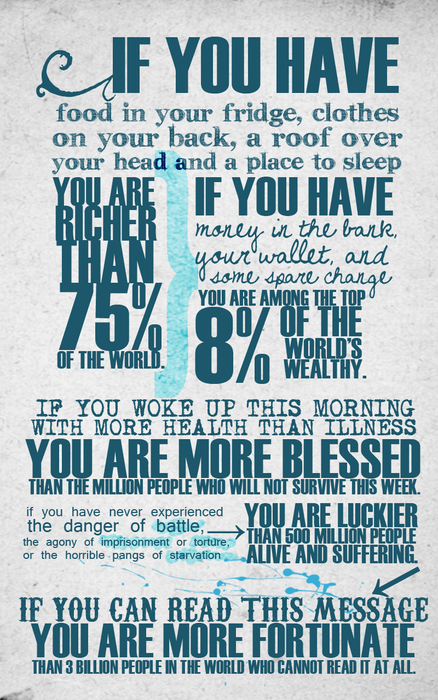 However, I am richer than 75% of the world. Paul says, in Philippians 4:11-12, "I am not saying this because I am in need, for I have learned to be content in whatever circumstances. I know what it is to be in need, and I know what it is to have plenty. I have learned the secret of begin content in any and every situation, whether well fed or hungry, whether living in plenty or in want." I am not sure I have that secret within me. I cannot say I have ever experienced true 'need' in the sense of not having enough to eat, or what it takes to possess the basic necessities. Nor would I say that I have plenty (depends on who's measuring stick we are using). What I struggle with is finding balance; knowing how to live within a class-driven society. How can I NEED a second car when people are going without food, how can I NEED a new dining room table, when someone goes to sleep on a park bench, for lack of a roof over their head, how can I NEED new clothes when those I have are fine (especially when others do not even have a second set)? Yet, on the other side of that coin, how do I minister to a class that has everything they need and more? How can I live like a pauper when those I seek to win are living extravagantly? The things I experienced in Nicaragua (a people lacking in basic necessities) keeps crashing into my need to acculturate (for the purpose of the gospel) to my middle class Mexican life. Money is a challenge every day; to be a good steward of that which is entrusted to me while ministering for the cause of Christ.